Mistransformed figures should be unacceptable when showing your product. Its equal to having a spelling error in your advertisement, completely unprofessional. Imagine if they released these images and called them Transfromers on the packaging? Considering hasbro’s history, Takara gets a pass on this one. They’ve had a spotless record for 30 years, they were bound to mess up eventually. I don't think it's a mistransformation as much as a conscious decision to put him in a pose that requires that part to swing down. Dunno why they went for it as it doesn't look very good. Still sold out in mere hours on Amazon though.. Anyone know the status of these on HTS? I’d check myself but I’m in class. Edit: just checked...all four are still in stock...this does not bode well. Does not bode well for what? Got home and found this on the porch. Can't wait to get it opened up. Jealous! Get us some feedback on it ASAP lol. I just took some pics (I'm by no means a photographer) and am going to make a thread for it. The idea is to try to sell your product, I would be embarrased as a company to have photos of my product out there like that. Imagine going to an auto show and the new Dodge Ram on display had a flat tire. It is an awesome toy though, really glad that one picture surfaced! Grimlocks is such a great design, in so glad we finally get a good representation of him!! 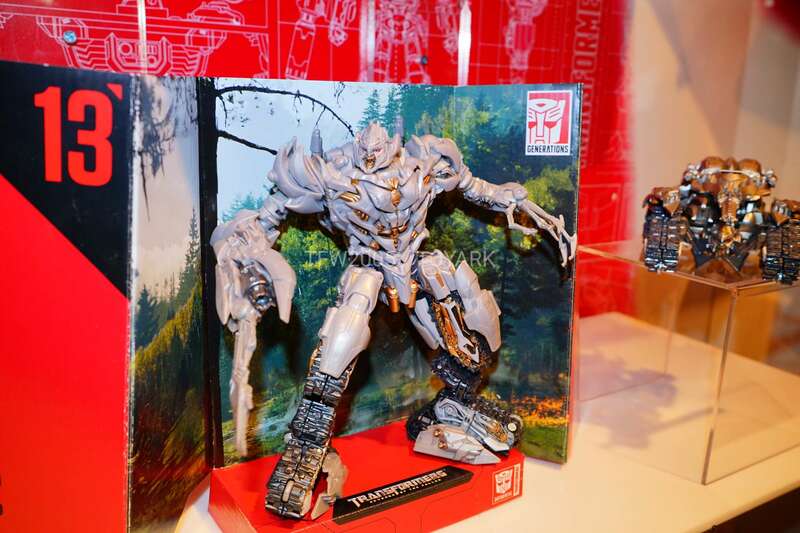 So, about Megatron... why is his tank mode prototype painted silver but the robot mode one just bare plastic? Please tell me that they'll release the silver one. The silver deco is a Toy Fair exclusive that was only available to Hasbro staff. Yeah I’ve wondered about that. Would be nice to get the silver, but it’d probably be way too many paint applications given the number of gold details there. Still, the sculpt and cleanness of the robot mode are good enough for Megatron to be one of my definites. Same reason brawl has two different colors of camo depending on the image. I don’t think either are finalized deco-wise. Wrong, it's Takara's prototype that was put on display only to be burned at the stake after Toy Fair, with the Hasbro staff dancing around the fire, chanting "Brand Unification, Brand Unification, Brand Unification!" At one point, John warden mentions there being 120-130 movie characters that they’re pulling from...when I add them all up, including old characters with new designs, and the four from the bee movie, I only get 104, so they must literally be pulling from every CG asset paramount has!!!!!!!!!!! Oh I totally agree, I don't think it's a very good idea either. Was just pointing out that I don't think it was an oversight.